If you look at the wires behind your entertainment console, you're going to see different colors tangled up with different things leading to different places you forgot existed. It's an awful ugly mess. Seeing the brain is like that, only the opposite because in its chaos is beauty. 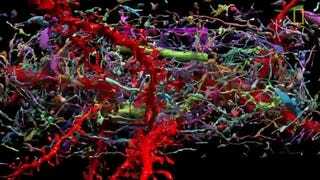 Just look at the 3D brain scan above that shows every synapse, it's like a 3D Jackson Pollock painting. The whole video by National Geographic is just so fascinating because we know so little. If understanding the brain is a mile long process, people much smarter than you and I say we've only moved about three inches. There's so much more to figure out. The video shows how super thin slices of mouse brains can let us better understand how the brain connects and communicates with each other. Researchers have animated the brain to connect the dots and colorized them to see what talks to which. It's the most complicated thing we got, it better look cool.